mine's a little full at the moment. after 11 years, chef veronica calvo-perez will be closing firefly bistro in agaña at the end of the month. i'll be sad to see it go; it is a comfortable, cozy space and the quality of food and service is consistently top notched. however, times change, so chef ronnie will be concentrating on her excellent bakery, cup and saucer, which will see an expanded menu soon, including some of the crepe rolls and salads from firefly. 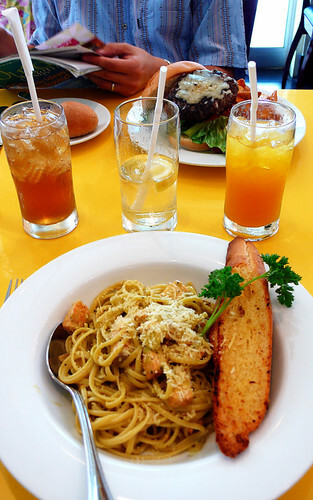 however, this may be the last week you'll be able to order any of the soon-to-be-missed entrees including the roast chicken, soft shell crab, pastas and burgers, so get thee to agaña soon! next to cup and saucer. not a review, just a quick look at meskla bistro in agaña, chef peter dueñas's new venture. he used to be the chef at sam choy, and was responsible for creating the local portion of the menu, the backyard kitchen. he's also the outdoor chef, lol. 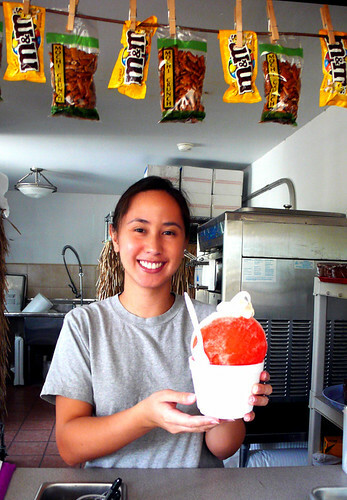 meskla, i think, means "mix" in chamoru; the cuisine is described as chamoru fusion. there are two menus--one for lunch, another for dinner, with a few items duplicated. we had lunch there today, but i look forward to checking out the dinner menu, which has more seafood and vegetarian options. 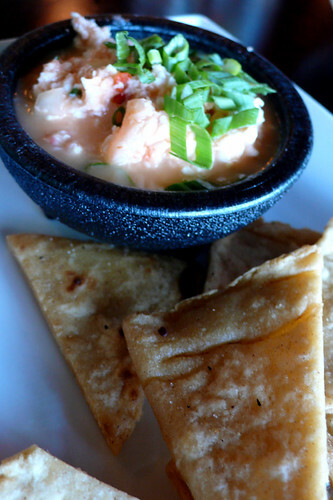 lunchtime kelaguen--the guam version of ceviche--changes, so ask your server. today was uhang (shrimp/prawn), served with fried titiyas (the local flatbread). light, fresh, lots of flavour, with a good onion, citrus, pepper ratio. excellent titiyas. 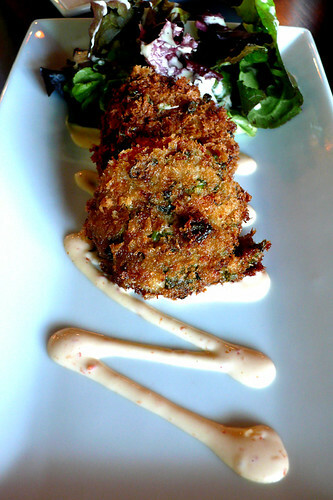 local-style crab cakes. i'm not a crab cake fan, so i only found these acceptable. crab is canned, finely shred, so the seasonings and (albeit modest) filler overpowered any flavour of seafood. i will say they taste like something aunty would have made. 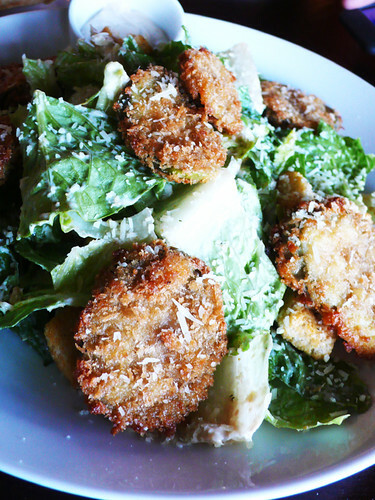 caesar salad with fried eggplant. (this is the third menu on which i've seen this item, is this the new chicken caesar??) i was curious. good romaine, lightly dressed (kudos for that, i hate too much dressing). a dusting of parmesan cheese. the dressing is very good--light, distinct flavour of anchovy. fried eggplant was good, but doesn't contribute much to the overall salad. 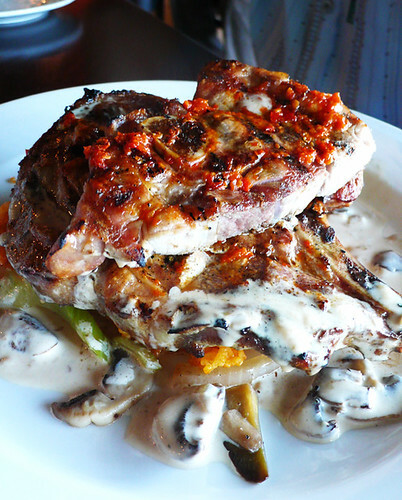 grilled pork chops topped with a hot pepper paste, served on a bed of the local red rice, sautéed veggies, and a mushroom cream sauce. expertly grilled meat, all the flavours came out well. one look in the open kitchen and you see a bunch of big guys who look like they all know their way around a grill and a carcass. you probably can't go wrong with a meat entree here. the menu is familiar but there are a lot of unexpected touches to keep it exciting. the entrées seem hearty and filling, but there are a few salads and a surprisingly light touch to the appetizers for those looking for a less heavy meal. prices are reasonable for guam, which means it's a little pricy, but you are paying for quality, nen. 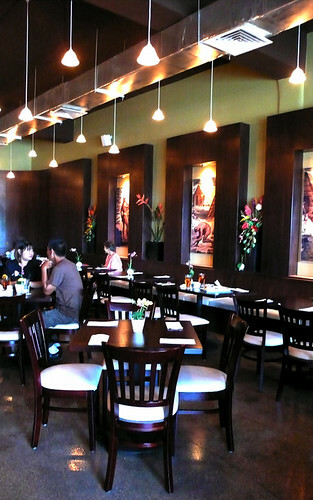 the interior is inviting, and the service was brisk but very congenial. despite being completely slammed, everything came out in a timely manner. a promising start. tax day, taxing day, had to take a little respite from the heat and chaos at mt. 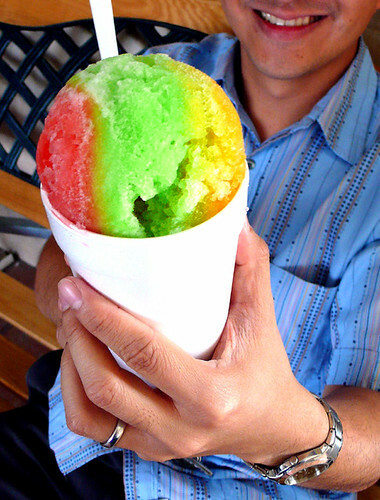 lam lam sno n ice cream shop. 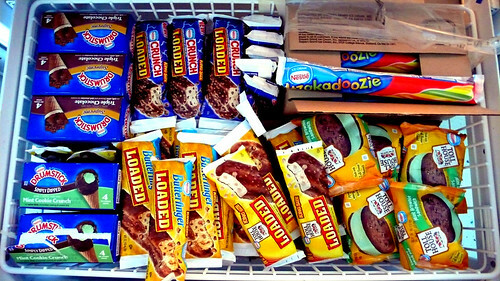 hope you managed to eke out a treat for yourself today! inspiration, thy name is alan wong. take some salmon belly, cut it into bite-sized strips. season with sea or kosher salt. heat up a couple tablespoons of vegetable oil in a pan, place salmon belly skin side down. fry until crispy, possibly up to 15 minutes because that's how long it sometimes takes. if your salmon strips are thin enough, you won't have to turn it over, but a little pinky rawness would never be unwelcome. meanwhile back at the ranch dressing, finely dice up a ripe tomato, some scallion, and capers if you have them. no worries if you don't. if you don't have tomato, i can't help you, but you will find a way, because you are a smart cookie. oh! ORANGE. that would work. really. dress with a little ponzu (or lemon juice), some soy sauce and/or sea salt, and a bit of anchovy or fish sauce. 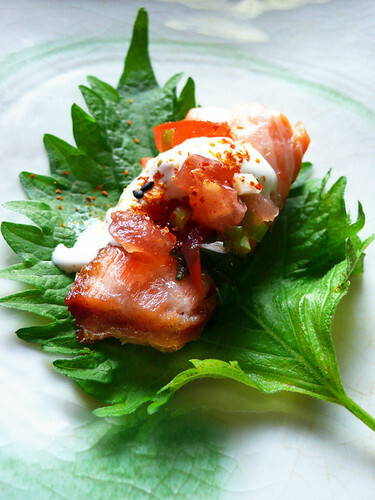 place a slice of your salmon belly chicharon on a shiso/perilla leaf (butter lettuce will work just fine). top with the tomato-scallion mix, a drizz of crème fraîche or sour cream thinned out with a bit of lemon juice, and a shake of shichimi tōgarashi. wrap. eat.